Can a direct link be derived from power-pop progenitors The Raspberries to all bands and singer/songwriters who subsequently took up the craft? On the face of it groups like the Rubinoos and even the Pezband have the Cleveland, OH legend's influence steeped all over them, whereas with Teenage Fanclub all the way up to more current practitioners Pugwash, the lines of inspirational genealogy are considerably more blurry. Good thing for the quartet of Eric Carmen, Wally Bryson, David Smalley and Jim Bonfanti, their reputation is unequivocally and undisputedly sealed, whether they were the collective brainchildren of a musical movement or otherwise. They may not have been poster-boys for the pop charts, but with four near-perfect albums to their credit the Raspberries legacy is still ripe for discovery for the yet-to-be-converted, and for continued exhalation for those already familiar with their music. They played in the mold of the Beatles at time when it was unambiguously uncool to trapise down that path, and a lot of listeners didn't really appreciate the 'berries until both bands had long been put to pasture. Frustratingly, beyond their four LPs: Raspberries (1972), Fresh (1972), Side 3 (1973) and Starting Over (1974) the group left behind little to no aftertaste to savor, save for the typical allotment of best-of compilations. No glorified reissues with expanded bonus material, and nothing in the way of outtakes or live performances from the band's heyday have hit the market to my knowledge. From my vantage point there have been no rumblings about anything of the sort surfacing in the future. Even what I'm offering here may seem scant, but it's the best I was able to scrounge up. A big thanks in advance to the fans that made this material available in one guise or another. This collection starts out appropriately enough with a pair of 1969 singles from two precursors to the Raspberries, Cyrus Erie and The Quick, both of whom featured Eric Carmen prominently in their lineups. The Cyrus Erie cuts exude a more than discernible Brit-invasion tincture, and though removed from the Raspberries I enjoy these songs tremendously. The Quick was the shorter lived of the two bands, but despite their lifespan, there's some development that bled over to Carmen's more renown successor band. 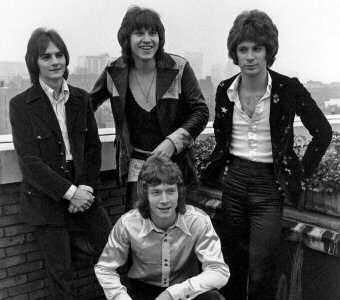 A related band called The Choir factors substantially into the Raspberries pre-history. Since I'm limited on time, please check out the hyperlinks at the beginning of this paragraph as well as here and here. A piano-laded, but ultimately rejected commercial jingle (track five if you're playing along at home) leads into a cluster of four Raspberries demos that predate the band's debut. These were apparently sourced from vinyl, but the audio is fairly pristine. We're treated to subdued previews of "I Saw the Light" and "Come Around and See Me," along with two other songs that I don't believe cropped up on later records ("Of Tonight" is not the same piece as the band's soon-to-come anthem "Tonight"). A good chunk of this tracklist is taken from a myriad of live performances including the fabled Agora Theatre in the band's home turf of Cleveland. Granted, we aren't offered a cohesive set from one venue on one evening, but the fact is live Raspberries recordings are non-existent save for a couple reunion concert albums, and the occasional live clip on YouTube. I'm not saying any of these in-concert renditions will make your hair stand on end, but you do get a bit of a rush hearing a vigorous run through "Play On" and "Ecstasy." Like any band worth their salt, the Raspberries in a live setting outpaced and out-energized their studio acumen. Needless to see these live tracks are the reason you're downloading this. Towards the end of this smorgasbord are a couple of informally recorded Eric Carmen demos, tracked at the residence of Michael McBride, one of Carmen's former bandmates in Cyrus Erie. Both songs, "Starting Over" and "I Can Hardly Believe Your Mine" would be re-cut for the 'berries swan song, Starting Over. These aren't mere rough sketches, so much as revealing alternate takes illustrating how they sounded outside the realm of the band. Pop craftsmanship to the hilt, even if Carmen is wont to channel Paul McCartney now and then. This set concludes with a 1973 live medley of *sigh* two pop standards, "The Locomotion" and "Be My Baby." Forgivable, if only for the fact it's Raspberries covering them. A full tracklist with sources is below. There is a FLAC version, however some of the Cyrus Erie/Quick songs were only available on MP3. BTW, if you're looking for one stop shopping for the entire Raspberries catalog, check out this handy mini box set with remastered versions of all four albums. Thank you - both nights have been awesome! Jeez, another winner. Speaking of Pugwash... I only became aware of their true sonic nature with this last album, because one of the reviews mentioned that Jason Falkner played on their latest album! So I look into them a little deeper, and I discover: oh, crap, they're actually a pop band! I never paid attention to them because the name "Pugwash" sounded so 90's Seattle grunge to me. Like "Mudhoney" or something like that. Turns out you can't judge a band by its name! Wow thanks very much. The cyrus erie tracks are really good! Great mix of Raspberries and early Badfinger. And what I would give to have been in the audience for that blistering live rendition of "I dont know what I want." Surprisingly good sound, and rivals 68-71 era live Who.